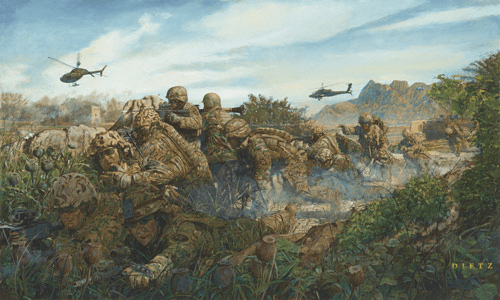 James Dietz Handsigned and Numbered Limited Edition Print:"The Game Changer"
Size: Image Size: 25" x 12.5" - Overall Size: 31" x 19"
Edition: Artist Signed and Numbered, Limited to 250 PP Signed and numbered prints by the artist. About the Art: In the summer of 1993 an elite special operations package called Task Force Ranger was deployed to Mogadishu, Somalia to find and capture a criminal warlord named Muhammed Farrah Aideed. TFR was an un-precedented and formidable fighting force made up of Delta Force Commandos, Army Rangers from the 3rd Ranger Battalion of the 75th Ranger Regiment, Air Force Operators, Navy SEALS and the Nightstalker helicopter crews of the 160th Special Operations Air Regiment. The assault force of about 80 men was waiting to be ex-filled when the first Blackhawk was hit. The radio exploded in a high pitched oration of what everyone on the ground was well aware of. ""We have a Black Hawk going down! We got a Black Hawk going down! We've got a Black Hawk crashed in the city!"" Super 61 piloted by Chief Cliff Wolcott had been hit by an RPG and crashed about five blocks from the target building. The mission had changed. All elements were now rerouting to the crash. "The Mogadishu Mile", as it came to be known, is the scene depicted in the painting. Super 61 was scuttled as the last of the assault force and vehicles left the AO. It is important to note that this battle was the first time in the history of special operations that Delta operators and Rangers fought side by side. Outnumbered 10 to 1, the men of TFR distinguished themselves in an 18 hour fire fight that would later be recounted in the book and movie ""Black Hawk Down"". Nineteen americans were killed and 78 were wounded in some of the worst urban combat seen by US troops since WWII. Four helicopters were shot down that day. The heroics of the men in the air and on the ground, fighting to save each other, is an extraordinary story of courage and commitment. To this day, Task Force Ranger is the most decorated special operations package in military history to include two Congressional Medals of Honor, one Air Force Cross, 5 Distinguished Flying Crosses and three dozen silver stars.